There has been much speculation about whether the Sony Ericsson Xperia X10 Android handset supports 32GB microSD memory cards. Originally the 32GB spec was included within the phones technical features (hence the fact that we’ve included it in the Specifications page above), however it was mysteriously absent in recent spec lists leading to some doubting its compatibility. However, a user on the xda-developers forum has confirmed that a 32GB microSD card works “flawlessly” in the X10. The debate is now over, but I do wish these cards were a bit cheaper at retail. £89.99 is the cheapest I’ve seen it in the UK at Play.com! actually you can find one on ebay for 25 euros.. really cheap!! Anyone knows if the cellphone supports microSD classes like 6 or 10? What does thiago mean “classes 6 or 10”? Ive seen on ebay 32GB cards that go for way cheap. does that mean they are of a different class? Actually, I just bought a 32GB card and it DOESN’T work in my X10 which pisses me off. Also reading on the SE website I know found out that it says 16GB there… HOWEVER!!! It is only the internal thing on the phone that doesn’t function when I use it and I can’t put music on from MediaGo. But I can place it there manually. Downloading songs via download programs directly to the phone doesn’t work though… I got gravely dissapointed but might just be me who fucked it up since I just aquired it. Will keep you posted if I get it working properly. Which brand/class of card is it Alex? It’s a shame that it’s not working as there appear to be a few people that have reported the 32GB cards as working. Because the 64gb micro sd will use xc instead of hc the x10 will not be compatible. SDHC devices do not support the XC format. That means that any device that works with HC format can not work with XC format and vise versa. I am still not sure what limit will be on XC devices but I would assume that it would be at least 256gb micro sdxc. I have read about 256gb’s being tested so I am sure 256gb will be possible. In fact, there is no reason a 1TB shouldn’t eventually hit markets. If we could just get processor and RAM speeds up we will have fully functional PC’s in our pockets. Imagine no more laptops! Simply place your phone/pc on a charge paid and connect wirelessly to a full keyboard and monitor, or your TV. Same concept for future cyber cafe’s and office work stations. We are not far away at all. The class of your micro SDHC simply refers to the speed at which you can access the storage; class 2 is standard. The higher the number the faster your data can be accessed. Class 4 is 2 times faster than 2, and so on. The class of your memory should not have any baring on weather it works or not. However, some times you hear about people having problems with certain manufacturers micro sd’s not working; this has nothing to do with the class of the device. I would hold off on paying more for higher speeds since the SDXC’s (which are much faster)are sure to be released in the near future. Meaning if you by 32gb now thinking you will simply use your micro sdhc in your next device, your next device may not support SD HC. I would start saving now, as the first wave of new SD XC devices are sure to be expensive. It’s a Micro SDHC Sandisk class 4. Having huge troubles with sending data to my X10. Still don’t know if it’s just my PC which is in a poor state (has been crashing alot recently). However, I CAN download music through download programs to the phone now and I can transfer music to the phone, BUUUUUUUT! Most files are getting corrupted (skipping part of the songs, mixing them with eachother, stuff like that). I hope that it is just my PC and I will be doublechecking with my 8GB card that came along with the phone to see if it is the PC or the fact that the phone can’t manage 32gb. Overall downside which I found out is the issue of some transfer problems using Media Go is that X10 doesn’t support WMA files meaning… If you ripped cd’s using windows media player without changing the standard settings, you need to change them. I don’t know if you can change them to MP3 without getting some special converter program. 8gb no problems what so ever. Works flawlessly at least for the ammount of files I transferred (105). After the transfer I heard 20 songs for quality checking and there was 0 issues at all. 32gb few problems. The transfer of the same files also functioned without any problems. After the transfer I also heard the songs (and they are still playing). It seems like there is an issue of MOST songs ending prematurely. After sitting and frantically watching the music timer thing I’ve noticed that it USUALLY happens around 3 minutes into the song (no problems hearing the rest if you just starts it at that time). Got some songs where it happens 20 sec into the song though. It states that it supports UP TO 16gb. This makes me kinda sad since it was this post that made me buy the 32gb card, guess I have to invest in a 16gb if I want something stable. If anyone has any tips or tricks that will make it work, or has 32gb cards in their X10 then please tell me if I am the only one with theese issues. Nope I just bought mine and Im having the same problem! Im just gonna get a 16gb card for now. Oh and if u look carefully in a lit up place u can see something next to the ear speaker, what is it? Jason B, what was the make for £13.50?? Jason b – the thing near the ear speaker is a proximity sensor. It turns off the touch-sensor when you put your ear against it. I have the same problems as Alex with just a regular 16GB SDHC class 2 card. Actually I have the same problem with two cards as I figured that the one might be damaged and thus purchased another one. Is there something with the phone? Or, as I have been using all sorts of adapters, a problem with the Media Go software? It is possible to transfer up until just about 2½GB and then things start getting weird. Finally Media Go stalls and the next time I disconnect the phone from the USB it says that the card is damaged. Then I remove the micro sd and put it into an adapter, format it completely and then try again. The same thing always happens. If I don’t transfer more than 1½ GB I can actually disconnect without anything stalling; but within one or two hours the phone desides that the card is damaged. The 4GB card that came with the phone works flawlessly. Anybody? actually is this phone supporing micro sd 32 gb or not ? is this phone supporting all software? My 8gb and 2gb sd card works just fine. But whenever i try to connect my 32gb i get a message saying the card is damaged, wich is weird cause it works just fine on the computer and its brand new. So my phone promts me if i want to format it, and everytime i try to do that – it just reboots itself, without any difference when its done. Still sais the card is damaged. Once i got a message saying that the card is blank, lasted for around 5 sec, then it swithed into saying ”SD card is damaged” again. Another time it said it worked fine – but that only lasted for a few seconds as well. Help anyone? I’m having the same problem with my Xperia X10. I purchased a Sandisk HC 32gb Class 4 Micro SD Card. When I put it in my Phone it just kept telling me that there was no SD Card installed. However it works fine on my Laptop and I can transfer info to and from it. When I rang Sony Ericssons help section they advised me that it would only recognise 16gb Sd cards. I did manage to find out from Sony Ericsson that there is an update coming out around September 2010. Not sure that the update is. Lets hope it may be a firmware update that will let the phone recognise 32gb SD Cards. It would be interesting to know why some people seem to be able to get them to work and others not. To all these ppl having probs with cheap 32gb cards off ebay, are u sure they are actually 32gb, I’ve bought 2 that where 2gb but hacked to look like 32, so any data above that gets corrupted. Search for “fake flash” for info how to test and report em to ebay and get ur money back. Yes Shaun Burrows, you are absolutely right. I’ve tested my card as you suggested and it appears to be a fake. 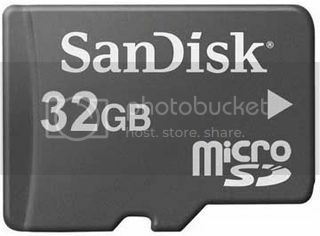 Is there a difference between 32Gb SD cards, and 32Gb HCSD cards? Seems like all the problems are related to the HC cards, and yet all the references to what works relates to 32Gb SD cards. What are the experiences of others, and can anyone confirm if perhaps 32Gb SD cards work, whereas 32Gb HCDS cards dont? To clarify questions about Secure Digital (SD) cards, there are early SD cards (<=1GB), newer SD cards (<=4GB), SDHC (High Capacity) cards <=32GB, and, in the near future, SDXC (eXtended Capacity) cards <=2TB. Hardware that can read newer cards can also read older cards (so SDXC devices will read SDHC) but not necessarily the other way around. The Speed Class Rating (2 – 10) is a minimum sustained write speed, in megabytes per second (MB/s). The default standard is Class 2. The 'x' speed rating (e.g. 133x) is more open to interpretation, and some cards may use it to refer to read speed (which is usually faster) rather than write speed, so read the specs carefully. 133x is equivalent to 20 MB/s. See http://en.wikipedia.org/wiki/Secure_Digital for more detail. As you can tell, I've read up on this, especially for cameras. Someone posted some jerky video from an X10, and (thanks Alex) it is probably because the card that comes with the X10 is Class 2 – not great for recording higher-res video with lots of movement. So, if you want to take good video (or speed up the loading of media onto your X10), it is worth investing in a card with a higher write speed – that's what you should be getting when you pay for some of the expensive brand-name cards. On Amazon (for instance), quite a few cards now have the 'Class' rating or 'x' rating listed in the product name. But watch out for fakes (thanks Shaun Burrows). Had the Xperia for 6 months now, very happy until recently purchased a sd card with 16gb. I transferred all music to PC then switched new card and transferred music, this is where the problems start. Every track jumps or mixes in for a couple of seconds with music that is not on the card but on the PC. Its like it got mixed up when transferring. The 8gb card I have works perfect but is nearly full. I have read other messages but cannot work out a definitive solution. Did think about sending card back as faulty but not sure it is! Have formatted a couple of times but issue persists! Thanks John for a very good summary of useful information! I am interested in buying 15pcs of phone memory card 32 gb , SD from your company.Let me know the total cost before sending payment to you. hey my x 10 is having problem when connected to my car it doesnt read automatically…..it request for the sd card to mount or not……plz help me ow can i make it read it……. i have a 2gb sd card in my phone but have low phone memory and i dont know how to get the phone to use the sd card can anyone help please??????????? Pls check this .. Even in the sony eric website it says upto 16gb only… has someone tested it?? Hey Shanu..on that site you are correct, it says up to 16gb. If you click the phone itself and go to the actual page and check the Specs for the phone…in the little blurb it has for the specs it shows up to 32gb. I’m using a Sandisk Class 4 32gb microSD card and have no problem transferring music with Media Go. I would like to go for a higher class but I’ve searched high and low and class 4 is the highest there is commercially it seems. Can anybody confirm that the x10 mini pro works flawlessly with a Sandisk 32GB class 4 card? Yes i can confirm that it works as i have one. I dont trust ebay at all these days, was great at the start but im done with it. it says only supports up to 16 mb. To those who are looking for cheap micro SD cards – DON’T BUY ON EBAY. Almost all of the sellers on eBay selling memory cards are scammers and literally all the auctions that look cheap are fraudulent. I know this from bitter experience. I buy loads of things on eBay but I would never buy flash memory again after my experience over the last 18m. This solution didn’t work, I bought a USB SDHC card reader from PC world for GBP 6.00 which has solved the problem. Hey guys, is anyone able to use 32GB SDHC Card Class 10 on your Xperia x10? I am planning to buy 32GB Card. Was Android 2.1 update solve the problem of those who complained earlier? I bought a 32GB MicroSD HC (class 2) ….. on ebay, from an individual seller (not a store). The troubles that I encountered related to reformatting and memory card locking and I think a bit of SE copyright protection of media. 4 mths ago … Reformatted and did a fresh sync with Media Go …. Advice that I found was :- the best possible combination will be 16gb ‘class 6’ . Regardless of Size or Class; is there an official “How to upgrade memory card” link anywhere? I fear the copyright police and “write protect” will block me on copying to any other card from my original (even if it is all legit media). 32GB micro sdhc cards do work with the X10 (2.1 OS original from SE), I bought a class 4 for me this week in the walmart website (the brazilian one, since I live in Brazil) and it works fine, but I haven’t tested it out with videos yet, only photos (they switch at a decent speed between each other) and music (no problems with this type of media too). Note that I haven’t surpassed the 16GB line inside the card yet, I still have 16,8GB free out of 29,9GB. If I get more info, like how it handles videos, I’ll post later. holas, que bueno que encontré este blog, ahora procedo a comprarme una memoria de 16gb, porque las de 32gb, según muchos comentarios; pone un poco lento el teléfono, lo mismo me dijeron los chicos de “Las Malvinas”, Lima. Man, I can’t believe all the people here that don’t know the difference between the different memory cards and class numbers. It took me less than 60 seconds to find a whole list of webpages with all of the definitions. Wikepedia is a good one to use. Why come here and ask silly questions before you even TRY to find the answers yourself? For one thing, the CLASS of the card is VERY important, and most high resolution devices require a CLASS 10 card if it involves higher resolutions or HD recording, regardless of how many GB’s it is. I own a HD Digital Spy Watch and a pair of Video Spy Glasses that record in Blue Ray HD Video, and have a 8 MP still camera in them both and neither will work unless I use a “Class 10” 8MB Micro SDHC card……nothing else less than that works. The reason I have to have a Class 10 is because the devices read and write in a Class 10 speed (more than 10 MB/s). The video Camera is a High Definition 1080P (1920×1080 resolution) (Blue Ray) and the still camera is an 8 MegaPixel (3264×2440 resolution) which is really fast………these REQUIRE very fast Read and Write Speeds or they will do weird things like “mix” songs together or cause severe “lags” in the videos, and will eventially post a “dammaged card” message………..JUST like you guys are talking about with your phones……………see what I mean? ONE MORE THING……..My devices will not work if I use a memory card that exceeds 16MB of MicroSDHC memory…….there is something involving the file system (FAT 32) or software of the memory card that prevents it’s using larger capacity cards. You definitely have the same problem. Therefore I have to conclude that you need to use no higher than a 16MB “Class 10” SDHC memory card if you want everything to work correctly on your phones. I HIGHLY suggest that you ALL read the Wikipedia website that defines all the characteristics of all the different cards and classes before posting any more questions here………you will be a lot happier if you do. Blue Ray HD and it is fantastic……I couldn’t believe it. And the still pictures are very high resolution too, I know by experience what I am talking about! I believe your phones will be fine with 16GB SDHC Class 10 cards, but you may want to try a Class 6 and see what happens. Can you imagine having your favorite Blue Ray High Definition movie on a MicroSDHC card? Actually, it takes 2 cards on 8GB (115 min each) and only ONE card on 16GB card. Anyway, you get the point…..I can carry 10 movies in a match box! LAST POST FROM ME…..HERE GOES….. I found out why the larger capacity cards (32 GB AND UP) won’t work correctly even if you use a Class 10……it isn’t the card at all……it’s the HOST DEVICE (your phone, my cameras)! They do not have enough “ON-BOARD RAM” to run that much memory and it’s control chip! It all makes sense now…..think of your card as a computer program on your Desktop PC that requires a LOT of RAM to run it propperly, like an intense game…….if you don’t have enough RAM, it will “lag” and “skip” and “freeze” while tring to get more memory from your actual hard drive. And we all know that won’t work because the hard drive is too slow (kind of like the “CLASS” being too low on your SDHC), and the end result is a “warning window” from the PC. In our case, it is the phone that doesn’t have enough RAM and no hard drive at all to go to……….LAAAAAAAG……….SKiiiiiiP………”Dammaged Card”………..FART. The only way to use a 32GB card or higher is to be able to increase the on-board RAM in your phone or my cameras…………get it? It certainly makes sense to me now, so if anyone can shoot down what I was told……please feel free to speak up! I bought a 8GB SDHC card (emtec). I had problems with the market, so I did a factory reset (after making a back-up ofcourse). That’s when the problems started. My phone can’t read the back-up file, if I try to take a picture my phone freezes and reboot (and I don’t have the picture) it doesn’t remember the links I used on the wifi-internet… The only good thing about it (for me, so far) is that I can use my apps again. WTH happend?? Why is my phone acting all weird? RICCO thanks for the great posts, and setting us straight. Hey everyone, here’s an eye opener for all of you. Go to the Sony Ericsson site, select country as United States, then browse to Xperia X10 specs. There you will find expandable to 32GB. Now comes the interesting part! On the above page, you will find a Country selection drop down at the bottom right of the page. Go select some other country, say India. Again, navigate to the specifications of the X10, and what have we got here? Expandable to 16GB!!! Btw, you will also find slight differences in the dimensions of the device. AND, the 1 GHz is not even mentioned in the Indian version. Just what ARE they selling in countries like India anyway? iam from india using xperia x10i.. iam planning to buy 32gb class 10 sdhc.. saw that two sites samuel told us abt… in the US site der is no mention abt android 2.3.3 update while in indian site it does.. when i contacted customer care service they also said x10 supports upto 16gb nd class 10 works..
from all these wat i felt is android 2.1 supports 32gb nd 2.3 upto 16gb. it bcos i used 2.1 nd 2.3 updates in my phne nd wat i noticed is dat 2.3 is more ram consuming dan 2.1.. lik in my phne its around 30-35mb available ram whereas i used to get 70-95 or even around 100mb free ram in android 2.1.. ok well what iam trying to say is 32gb memory load needs more ram for the processor to make it stable everytime during read and write.. when phone is in idle der is continuous data read and write depending on application installed and other online widgets. so.. 30mb free ram 2.3 OS wil work or get slow dan 100mb free 2.1 OS… i tink 32gb nd 16gb is now an issue depending on android OS types.. x10 had ram of 384mb out of which around 100 or 90 is shared for graphics lik graphics sharing in PC motherboards..
guys just tel me iam rite or wrong..
32gb class 10 sdhc may work fine in xperia x10i but also there is a chance to get hanged or crashes nd get automaticaly restart.due to low system memory.. this i tink it wil happen wen more than 16 or 20gb is filled up in 32gb card. iam going to test both 16gb class 10 and 32gb class10 sdhc on my phone..and wil update abt it here. Hi. I bought a Samsung Micro Sd HC 32GB card for my new X10. It’s works fine for music and for seeing album and video in the gallery, but it make “out of service” camera and it’s impossible to use it. Sorry, I forget to say that my Samsung 32Gb sd card is class 10 card. I bought a SanDisk 32GB card to use with my XPERIA X10 mini. It doesn’t work (just like the specs suggested). Now I use it as a flash drive instead. It works well with my SanDisk 64 GB microSD class 10. I’ve got a sandisk 32gb micro sd card from Amazon for 13 pounds. My business partners were needing a form this month and encountered a document management site that hosts an online forms database . If others need it too , here’s https://goo.gl/nON3q1. Xperia X10 Gingerbread update finally rolling out!